The Stable Yard at Morden Hall Park, National Trust are pleased to present What A Time To Be Alive; the first solo exhibition of London based artist Dwayne Coleman and the first contemporary art intervention at the gallery. Informed by cross-social class connections arising from living in London and his background and personal affiliation with working class areas of Leicester in the East Midlands of England; Coleman’s work questions notions of individual and cultural identities and language. The exhibition comprises new - site specific - paintings, draperies, sculpture, video, and sound works, all of which build on relationships with personal references of his working class upbringing and that of visual, aural and social patterns of counterculture society. Using the architecture of the space as a mode of display, Indigo Fragments: Boro [Hung], draped patchwork paintings hang over the beams throughout the space- recycled yet refined, they continue to express their original functions and resonances. Influenced by 17th century Japanese textile method ‘Boro’ (translated as rags or scraps of cloth) Coleman adopts this method as a way to explore ideas of socio-historical statuses. The principle of ‘waste not want not’ in Boro textiles, was often reiterated during his own upbringing. Works are devised using found, dyed or recycled fabrics where they are enriched with coloured swatches and stitching. Colloquial language when talking with friends, plays throughout the gallery space, accompanying the sculptures, paintings and videos. Focusing on colloquial languages rather than the stories themselves, this collection of stories focus on each individual’s dialect. Situated at the far end of the gallery space, a destroyed car hovers in the middle of a screen. Similar to that of joy-ridden cars dumped and left at their scene, the car sits in limbo, mid air. Drawing on a sense of utopia, the work avoids looking at the negative aspects of joy riding and its repercussions, the film is solely a homage to the artist’s memories of the Saffron Lane Estate where he grew up. This work is coupled with Dream, another video work. 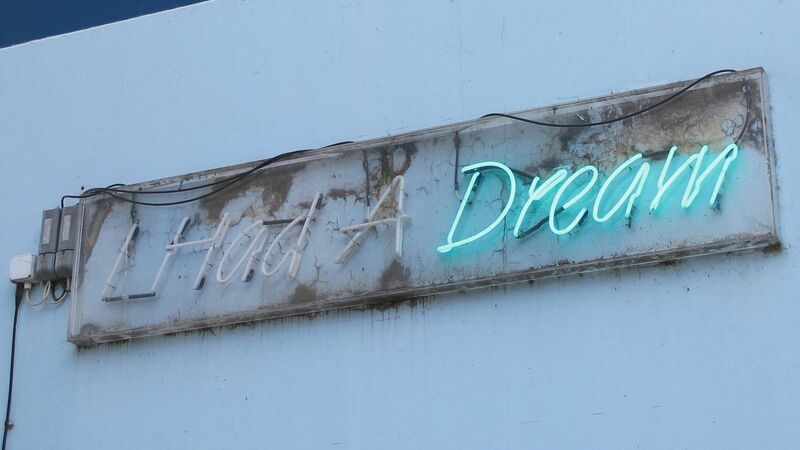 A neon of the words ‘I had a dream’ flicker on and off. Situated near Coleman’s apartment on the Aylesbury Estate, Southwark, one of the poorest and dysfunctional council estates in London, which is currently facing radical plans to be demolished and gentrified. The flickering element, created by Coleman suggests that the estate is on its way out, shadowing the fate of the estate. Dwayne Coleman (b.1988, Leicester, UK) lives and works in London. He graduated from the University of Westminster in 2011 with a BA (Hons) in Fine Art (Mixed Media). Exhibitions include; 86, 86 Commercial Street, London (2016); Cascading Relevant Information, Open Eye Gallery, Liverpool (2015); HIVE 1, Hois Clos, London (2015); TOTAL SELLOUT, Daily Goods, London (2015); Paintings on display, Urban Outfitters, London (2014); BOMBAST, BOMBAST Gallery, London (2014); Apologies in advance, BOMBAST Gallery (2013); FOR, Darnley Road Gallery, London (2012); Selected Drawings, Arbeit Gallery, London (2012); Medium, Ambika P3, Marylebone Road, London (2011); Eclectix, Commercial Road, London (2010); SHAKE, SHAKE, THROW, Gallery West, London (2010); IN THE BACK OF YOUR MIND TO THE TIP OF YOUR TONGUE, Gallery West, London (2009); Skelebrities, Public Exhibition, London (2008) and A painting on display, ‘Y’ theatre, Leicester (2008).